The media and analysts like to say Yao is working hard with Pryzbilla and Oden on him banging away, but I have to disagree. Maybe I’m spoiled because I remember seeing Hakeem fight harder in the low post. Not that Yao needs to battle in the paint all the time to get himself open. I’m perfectly fine if he does it a different way, like coming toward the ball and being a little further outside of the post area when he receives it. That’s because he can hit shots that are 2-3 feet outside of his normal post position. Instead, there were several possessions when I was wondering why Yao didn’t move over to the strong side of the court when one of his teammates like Brooks or Artest had the ball, with them tempted to hoist up a bad jumper or 3-pointer. I’d look for where Yao was on those possessions, and he would be on the weak side of the court just standing there – behind a defender — wondering when his teammate with the ball was going to create something. I’m sorry, but Yao has to get over there to help out his teammate by giving him an easier passing lane to get him the ball. Maybe the coaches are telling him to stay on the weak side, and if that’s the case, that’s not very smart. Or at least Yao should move to the free throw line area where he’ll be able to free himself a little easier from his defenders, get the ball, and shoot from the free throw line area. REMEMBER, IDLEMAN, YAO SHOOTS OVER 85% FROM THE FREE THROW LINE. A SHOT FROM AROUND THE FREE THROW LINE AREA IS AUTOMATIC FOR HIM! And there were possessions in the first half where I thought Yao didn’t take a shot he could have taken. Instead, he’d pass off to a teammate, who would then miss. One other reason why the Rockets might have lost is because of questionable foul calls against the Rockets (23 free throws for Portland, only 10 for Houston). I’ll be the first to call out the officials for bad calls, and there were some, but I don’t think it was the main reason why the Rockets lost this game. Overall, I just see poor coaching in the two losses in this series where Brooks and Artest are able to run amok with the ball, while Battier disappears. Brooks is a second-year player and shouldn’t be expected to shoulder the scoring load, especially when it’s obvious he’s having a bad shooting night. That’s when Idleman has to play Lowry more, who was acquired for that very reason — for “insurance” purposes. So use him more than the 13 1/2 minutes he got! I’ll give Idleman a lot of credit for where he brought the Rockets this season, but if they want to win this series, then everyone’s got to improve, including the coaching. Idleman is a fine man and gentleman, but I never really hear him blame himself in the post-game conferences. At least JVG would blame himself often times for ‘poor coaching’ when the Rockets would lose games to take some of the pressure off the players. I’ve never heard that from Adelman, so maybe he thinks the staff is doing a fine job, even during the losses. I don’t know. So here we are again: the Rockets holding a lead in a playoff series like they have had a couple of times the past few years, facing a game where they can close out their opponent and advance, or lose and have to play a very difficult Game 7. A couple of nights ago I thought my prediction they would lose this series was going to be wrong after they went up 3-1. But given how poorly they played down the stretch in Game 5, I’m afraid my prediction may become more of a possibility than I would like it to be. If that were to happen, with another collapse happen before our very eyes, I think you could see some of the changes in the roster I predicted after all because it could be those same players who end up being culpable. But rather than think about that scenario happening, I’m hoping everyone (including me) can keep thinking positive thoughts entering Thursday night’s Game 6 in Toyota Center, and then worry about what fixes need to be made to avoid getting swept by the Lakers. I know one this is for sure: if you thought Yao was focused in Game 1 when he went 9-for-9 from the field, his intensity is going to be off the hook for Game 6 because you know sure as hell he doesn’t want there to be a Game 7. I hope he wants to advance out of the first round so badly Thursday night, he will take it upon himself to win this game, and maybe once in his life as a Rocket, he’ll demonstrably demand the ball from his teammates no matter who sees it. This entry was posted on Wednesday, April 29th, 2009 at 3:53 am	and is filed under 2009 NBA playoffs, vs. Portland. You can follow any responses to this entry through the RSS 2.0 feed. So when Yao was just getting hot when we took the lead in the 4th quarter, Idelman pulls him out. Moves like these are making me pulling my hair out. Let's get this thing over with on Thursday! thats one of the prb.. .. i dont understand why the cocah let ab in.. he should bench him..
As I've posted many games before in the forum, I'm really sick and tired of this read and react thing from Rick Adelman. You're so right about him not calling time-outs when the TrailBlazers were on a 15 ~ 0 run. It's inept coaching. And one thing I really can't understand. Even though Kyle Lowry had 2 consecutive tic-tac fouls called on him, he should not be immediately be replaced by Aaron Brooks. He got only 2 fouls, and it was not like he had already 4 or 5 fouls already. So why in a haste to substitute him? As you said, he was at least organizing the offense well, and he played tough defense on the TrailBlazers. Once Aaron Brooks came in, disaster struck…..a 12 ~ 0 run with 6 consecutive offensive possessions either ended up in bricks, or called for offensive fouls. I also felt strange that why Yao Ming seemed to be playing quite passive in 1Q. He seemed not trying to fight for position hard, and was with very little no-ball movement and running. Not sure whether it was per Rick Adelman's instructions. But for such a crucial game, it really hurts to see Big Yao playing so hesitant and tentative during that first quarter, ended with ZERO shot attempts/points. Sometimes I really felt it is difficult to be a Rockets fan. They always tend to make life difficult for themselves, and find ways to lose games that they should have won. John, totally agree with your great analysis. Some stupid plays late in the game … hurts allot. Brooks: he can't take over the game by scoring alone, and he's not Tony Parker, CP, etc. Trying to score the basket by himself in front of a couple of 7-footers, several times? He's not thinking. Artest: What can I say? Wild Ron showed up again. Battier: Can he play one-on-one offense down low? (I saw him doing it in the past.) Riding on Yao is good, but when you can't, what's wrong with attacking the basket yourself down low, like Scola? Or get some tough cut after passing the ball to Yao? Yao: Maybe previous +40 minutes wore him down. He needs to coming toward the ball, if he can't shelter the defender, to get it and shoot the 15-footer. Scola: the ref killed the only smart Rockets starter in the game. A very questionable 4th foul. Wafer: Attacking basket is good. But when Oden is coming at you to block it; your big man, Yao, is wide open UNDER the basket!! Pass it, Wafer, to Yao, he could dunk and maybe get another foul from Oden. Coach(es): no clue. (Both me and them) Maybe like an old Chinese saying: you can't see a mountain when you are in it. John, I now realized what you said earlier about Portland team. They are really good. I didn't pay attention to them during the regular season. I think we have to prey now. Rockets need to play a perfect game on Thursday and the refs know it's Rockets' home this time. I'm a little worried about you saying that Yao will take it upon himself on Thursday. He tends to fight too hard for the post in the past, especially in game 2. He needs to play smarter. Also, he can't do it himself. You guys have forgotten what got Yao touches in the 4th game is because he followed Adleman's advice and stop fighting too hard to get the ball but to rather just hold his ground and let the offense come to him. That enabled him to also free himself easier to grab rebounds. I thought he did that quite well in the 4th game. THAT was the reason why you saw what you saw in game 5. 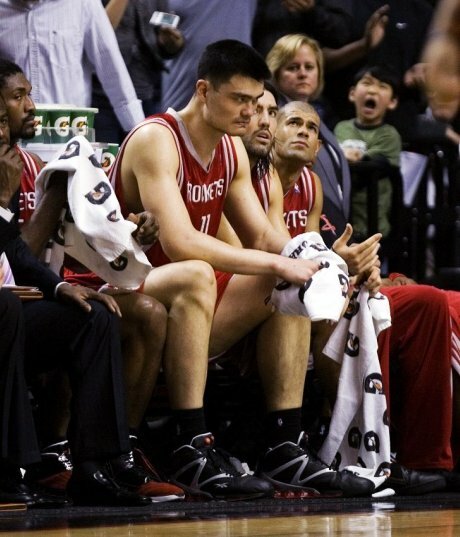 Yes he was being extra passive but I think the coaching staff has finally taught some common sense into Yao. Now rather if you want to blame the players not passing into Yao more, there could be some truth to that but not a whole lot. They need to whip the pass in there quicker then usual. This small window of opportunity is actually a by product of Yao's deficiency to counteract Portland's front defense and allow them to hover their body over him. You can say that Yao is not mobile or quick enough to counteract, but in actuality it is a matter of boxing out fundamentals that Yao hasnt learned or put too much time into. Instead he wastes his energy pushing around, running from one end of the court to the other. In other words, Yao is overrated as a thinker. He needs to be smarter with his footwork, his fundamental methods. He doesnt need to always fight for position in the same area time after time. He could easily get it from the elbow and then go back to position to post up. But what does he do when he gets it in the elbow? He passes it up. Yes Adleman couldve been smarter with managing the games with time outs and telling his players what NOT to do. But he is what he is. He's the type of coach to let his players play and react. Great system for smart players. It's just that Artest is doing what I was afraid what he is going to do. Jack up shots instead of driving in. AB is trying to do layups like it's college. If the Rockets lose game 6, folks it is a wrap, cause they ain't winning game 7 in Portland. We've been there done that. Not until Yao takes a summer off and actually really learn the fundamentals and smarten up. AMEN! Same thing again: Artest and Aaron became McGrady in the late of the game. I totally agree. When Brooks and Artest look like they'll fire a shot, Yao and the rest of the teammates expect that, too! That's why Yao doesn't move and just start to wait for the rebound. This cannot continue! He needs to still battle for a position and ask for the ball. If he gets their attention, they may change their minds and pass him the ball. Even if they don't, at least the coach may start to say something about it after it happens too many times. But if Yao is quiet all the time, even the Coach can't say much. They have to win tonight. This is not an option.